I’ve been using the new DaVinci Resolve 12 beta for the past week since its release. Not really for mission critical stuff, but duplicating projects when I have extra time and learning the work flow. I’ve said before that the new Resolve is what Final Cut Pro X should have been and I’m thinking more and more like that today. Unfortunately, there isn’t much in terms of training or forum conversations regarding the little features that matter to my workflow. I was ready to kick Resolve 12 to the curb because there didn’t appear to be a way to add audio effects to an entire track via the Track Mixer. It’s a little different than other NLEs but it’s not too hard to do. To be clear, I’m talking about applying an effect to an entire track full of audio clips. I use this frequently when I have a single speaker’s or actor’s clips from a given scene or take on a single track. 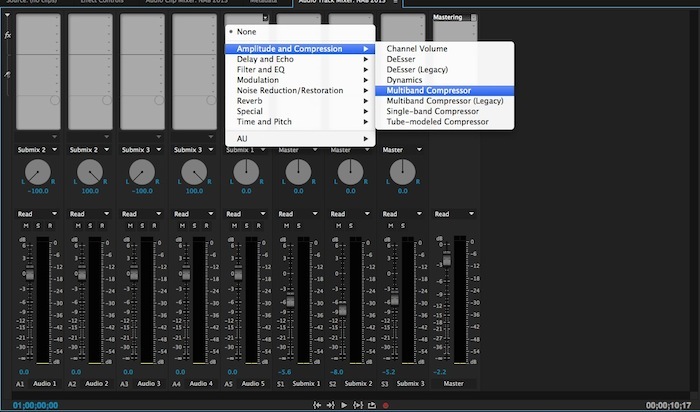 Many times the delivery is consistent enough that you can apply the same EQ, compressor or noise reduction to all the clips. Applying the effect to the entire track prevents you from having to copy and paste effects across dozens of clips. I live in Premiere Pro most of the time. The layout of the track mixer is very much like a traditional DAW like Avid Pro Tools (even if the operation is much less powerful …. don’t get me started). I prefer this kind of interface but I’m open to trying new stuff if it works better but I really, really want to apply effects to my entire audio tracks. I reached out on Twitter a couple of times with this question, pinging Blackmagic and other user groups with no answer. Today, however, I happened upon the process and still haven’t worked out all of the kinks but at least I know how to apply audio effects to a track. So, I wanted to share it with anyone else looking for the same solution. So here’s a simple diagram that shows the interface and the process to apply and edit audio effects on a track. Drag the chosen audio effect to the head of the track (not on the track or clips of the track). 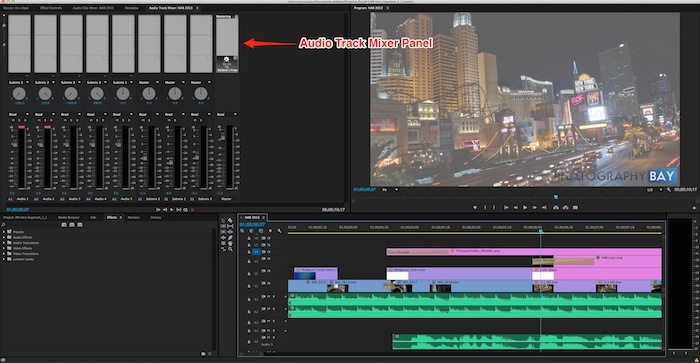 Click the track keyframe icon, which expands the track and combines the clips into a single black clip/track. Click on the new black clip/track icon, which selects the track and makes controls available in the inspector. Adjustments can be made directly in the inspector to the individual controls of the effect. The custom menu from the effect manufacturer is also available in a pop-out menu that you can select from the inspector. Things still aren’t perfect and the Resolve 12 audio process is a little buggy – but, hey, it’s in beta. I’ve had it crash while applying effects or single out one channel of a stereo track when applying effects and other weird stuff. The point is that you can do it and that’s an important part of an NLE to me. Sure, you can bounce it out to Pro Tools or Audition but for a lot of us, that is a little overkill on a workflow for a short project video – especially when you have an established workflow in a competing NLE that keeps you in the program for the entire project. Have any other video editors tried Resolve 12 yet? Do you have any other tips or frustrations to share with the rest of us? Where did you get the audio effects for resolve in the first place? Mine just says “No audio plugin installed” when I click on “Audio FX”. What plugin did you use that worked? Hey Cameron. I’m actually not sure what is included for DaVinci Resolve’s audio plugins. I have other NLEs installed on my system, as well as audio plugins. It could have pulled some of these plugins into Resolve whenever I first installed the beta. I’m just not quite sure though. Hey bro, Question for you. Say you have 15 audio clips of the same person talking, and you want to apply half a dozen Audio effects onto each one (but not the other talking clips of other people). In FCPX, you can copy and paste the attribute or create an effect and name it and then apply that to all the other clips. Is there a way to copy the attributes from one audio clip and apply it to multiple ones without effecting each change individually for each clip? Not sure. The first thing that comes to mind would be to nest the clips together after the edit is locked and apply the various effects to the nest so that the underlying clips wouldn’t have their attributes changed. I think a nest is called a compound clip in FCP X.
I’d also suggest checking out Larry Jordan’s tutorials on FCP X. 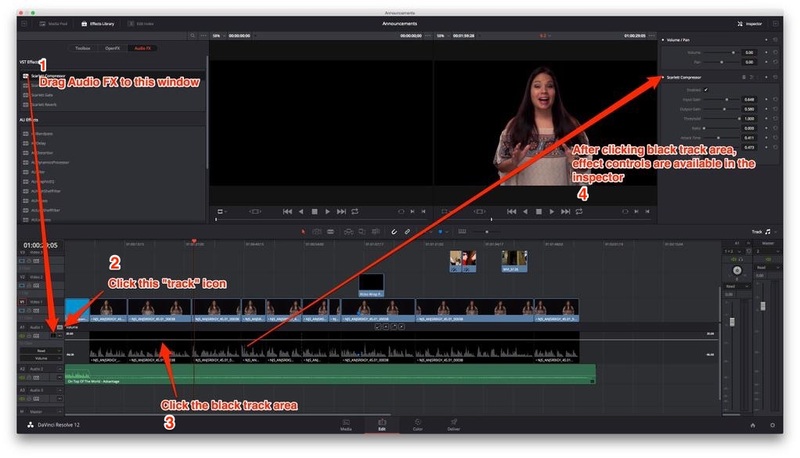 He has a pretty solid repository of tips and tricks for FCP X. Thanks Eric. I have made the switch to Resolve for editing and want to figure out how to do it in Resolve. Sorry Dalton. I misunderstood the question. Thanks for this, exactly the function I was looking for! Like you I do my audio finishing in Premiere and it frustrates me that other options (such as Lightworks) have such limited audio mixing. 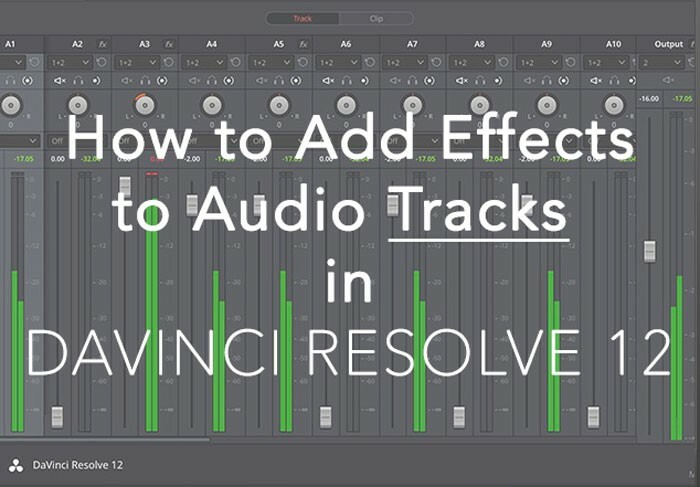 In DaVinci Resolve 12 it doesn’t seem possible to add an effect to the master audio track, is that correct? I like to add a final limiter to the masters. Playing with this a bit further, it seems to me that you can add effects to the master track in just the same way. The only slight ‘difference’ is that you have to click in the empty track lane of the master track to view the effects in the inspector, which is perhaps slightly less intuitive. You would think clicking the track header would bring any track based effects into the inspector. Still, more good news about the facilities available in v12! Great! Thanks for the follow-up! Thank you! I’m used to Premiere mixer as well, so much more functionality. One question though, you mentioned “The custom menu from the effect manufacturer is also available in a pop-out menu that you can select from the inspector.” How are you able to do this? I can only access the slider controls in the inspector window. When I press the little button that looks like 3 little sliders (next to the trash bin icon) which I assume is to activate the FX GUI pop out, nothing happens. It’s really annoying to use the sliders instead of the effect interface. Does that Plug-In native GUI interface gadget within the Inspector now work in later versions of Resolve — for AU Plug-ins now? It would be terrific if Softube Console 1 hardware/ plug-in software combo $499USD worked seamlessly in Blackmagic Design DaVinci Resolve! Auto Track Names and Numbers is not supported in Resolve! as a result, Softube’s awesome Console 1 channel strip controller and software have to be _manually_ entered — I.e., set up with the corresponding Track Names and Numbers from Resolve’s Tracks. What a powerful duo this setup is, otherwise!